$38 million, 5 story building with 80 beds. That sounds very expensive per bed. $475k per bed. Also, that doesn't sound like very many beds per floor either. 5 story building for only 80 beds... And at 114,500 square feet, that's about 1400 ft2 per bed! I know there's tons of other stuff that will be there and that is likely takes a lot of different waiting rooms and common areas and medical rooms, but it seems like quite a bit of space per patient. But I guess that is how it is in health care. Hospitals are even higher in cost per bed. It is a shame this stuff is so expensive and that Oklahoma is so far behind in having adequate health care facilities. I wonder what happens to the existing Parkside hospital? 114k sq ft. You can probably expect the first floor is entry, waiting, vending, security, etc. and has no beds so 91k sq ft remaining. Probably at least a floor for intake, examination, treatment, records, etc for 68k. On any office or hospital plan you have bathrooms, elevators, extra wide hallways, etc. that take half of the remaining so 34k. Add nurse stations, office, supply closets, etc and I bet you are closer to 24k sqft or roughly 15x20 which is not far off. In hospital construction, like with many things, overhead is huge. The future of a former children’s shelter site in the Pearl District should become clearer in the next couple of months. At a Tulsa Development Authority meeting Thursday, a city official updated progress on the 4.4-acre site, of which 2.6 acres will be offered for redevelopment. Proposals are due Oct. 13 and the TDA could choose one by December. Part of the city’s 6th Street Infill Plan, the property is an entire city block, bounded by Seventh Street on the north, Eighth Street on the south, Rockford Avenue on the east and Quincy Avenue on the west. This location is less than a half mile east of the Tulsa Central Business District. Roger Acebo, acquisition and relocation administrator for the city, said Thursday that the former Laura Dester Shelter site is challenging because of its C-shaped development area — a portion is reserved for flood control — but he said he expects it to receive between three and 10 proposals. The interest has been mainly from Oklahoma and surrounding states, he said. The state of Oklahoma sold the site to the city in 2015 as part of the city of Tulsa’s 6th Street Infill (Pearl District) Plan, and in January 2016 the city approved TDA to act as an agent to acquire other properties in this plan area to redevelop. Real estate unavailable for redevelopment (about 1.80 acres) will contribute to flood-management in accordance with the Elm Creek Watershed Plan. Eventually, city storm-water management staff will work with the selected redevelopment firm on conceptual design of the flood control basin on the site. Ten parcels have been acquired by the TDA and five are being razed by the city: 717 S. Rockford Ave.; 718 S. St. Louis Ave.; 727 S. Troost Ave. (land to be held for TDA redevelopment); 1007 E. Fifth Place and 1124 E. Fifth St. An additional property (414 S. Owasso Ave.) is under contract awaiting the start of an environmental phase. TULSA, Oklahoma - We're getting our first look at what some developers envision for the former Laura Dester site in Tulsa's Pearl District. Six months ago, the Tulsa Development Authority put out a request for proposals asking developers what they would do with the space. The site near 8th and Rockford has been abandoned for years. But Tuesday, we got a look at what we could soon see there. The neighborhood is welcoming new businesses regularly, like Garrett O'Dell's Cirque coffee. "There are a lot of creative minds that are opening up businesses here and working out of here," O'Dell said. But a problem, he said, is there isn't much of a live or work environment. "Sort of since we've opened here there has been virtually no foot traffic in this area and so anything that can bring that here is awesome," O'Dell said. He is referring to a proposal by Tulsa-based Ross Group and Nelson Stowe, who are partnering with lead developer PrairieFire out of Kansas City. At least 140 apartments, parking, and a central courtyard that goes along with the city's request to keep that flood retention land in place. Most people we spoke with felt good about it, saying it's something that will bring people to this area and keep people here who were considering leaving. But some question why the proposal has the current buildings being torn down instead of repurposed. PrairieFire development said the buildings simply aren't in good shape and the cost of rehabbing them would be substantially higher than building new. "I think most developers come in and say 'how can we maximize the land, do a really quality infill project that matches the neighborhood but uses the land well and I think they have hit that target really well," Benton said. I know the existing buildings there aren't really cool looking right now, but I wish someone would propose a way to re-purpose them into housing. I'm not a huge fan of this proposal for that reason. It demolishes everything there and starts from scratch. There are plenty of completely empty lots where that sort of thing would make sense. Why not use the existing brick structures? I bet they could look amazing. I do like that they have proposed 140 units (That is a lot for that space) and they look pretty good. Being 4 stories would make it a really good use of space for the area also. I wish they would've aligned the longer section on Quincy Ave so that more units could be closer to the heart of the Pearl District. Hopefully the TDA will ask for that. It may not sound like a lot, but that change would take the farthest parts from 0.4 miles away from the Phoenix/Cirque (where it mentally starts to feel like a longer/inconvenient walk for most people), down to 0.3 miles away where walking seems like the most convenient option. On a day-in day-out basis, it would be far better for those to be as far to the NW corner of that lot as possible. I see that lot closest to Quincy being developed as a separate building, maybe live-work townhomes. A proposed redevelopment of the blighted former Tulsa Boys Home/Laura Dester site has been scrapped, the Tulsa Development Authority announced Thursday. The action came after about a one-hour executive session at the TDA’s monthly meeting. A group of local developers had backed a project called Pearl Place, which would have converted the former Tulsa Boys Home/Laura Dester site at 1415 E. Eighth St. into 60 to 65 loft apartments. The investors in July initially presented the proposal to TDA, which voted to allow the group to enhance its plan. On Thursday, TDA Chairman Roy Peters read a joint statement from the TDA and the investment group, OMG LLC. “The parties have been in active negotiations for more than eight months and, despite having expended a great deal of time and effort, have come to the collective realization that a redevelopment of the existing facilities at the site in their current condition is neither practical nor financially feasible,” Peters said. TDA will be voting in the coming weeks on whether to move forward with the demolition of the site’s five buildings. “Meanwhile, the city and the Tulsa Planning Office are evaluating opportunities to identify interim uses for the site to ensure that it remains an asset to this quickly developing area of Tulsa,” Peters said. Tulsa Boys Home dormitories were built at that site beginning in 1948, and the property later became the Laura Dester Children’s Center. The state of Oklahoma sold the site to the city of Tulsa in 2015 as part of the city’s Sixth Street Infill (Pearl District) Plan, and in January 2016 the city authorized TDA to act as an agent to acquire other properties in this plan area to redevelop. The property has long been a hangout for vagrants and a drain on the city’s budget. At a TDA meeting in July, TDA Executive Director O.C. Walker said that during the growing season, mowing the property costs about $3,500 monthly, with security running roughly $1,000 over the same period. So another bunch of old buildings will be demolished. I wish they would elaborate on why repurposing the buildings was "neither practical nor financially feasible". What makes those so different from the many many buildings which have been renovated all around into multi-units? They were brick exterior and looked solid and in much better shape than many of the single-family homes I've seen get renovated. How is it $3500/month for that property? I need to get a lawn business and get some contracts for the city! After they demolish all of the buildings, it will be far more expensive to mow! They are going to be demolishing 5 buildings with a combined 42,000 square feet. That could potentially be converted to 40+ apartments in an area of growth. Instead, it will be empty lots and will likely remain that way for well over a decade, increasing the monthly lawn care cost and ending any sort of ability to bring in revenue from the property, wasting thousands of tons of brick and concrete along with other even worse types of wastes. Is the TDA run by the same people running the Tulsa Fairgrounds (with the preemptive Drillers stadium demo)? It sounds like the developers couldn't make the project work with the existing buildings, what about once the site is scrapped? From a map, it looks like a there is a lot of open space around each of the five buildings, which could account for the high mowing bill (although the picture accompanying the article does not indicate it was being mowed very often). That may also explain why the economics of rehabbing the existing buildings won’t work. It wasn’t clear from the article, but was this put out to bid, or did the group negotiating with TDA have an exclusive deal? If it was just an exclusive for this one group, it is unclear how the TDA can determine it is not economically feasible to redevelopment the existing buildings. Given the prior use, I can see why it could be very expensive to rehab these buildings into apartments, but the TDA hasn't exactly earned a lot of blanket trust on these matters over the years. You're right, that the bulk of the property is grass and they don't mow it very regularly. Regardless of any use of that block, the TDA said they have to keep a large portion of that property vacant for flood mitigation. That part is the bulk of the lawn maintenance cost and that part is mandatory irrespective of what happens with the existing buildings. The proposal was 60-65 units and just a few units would cover the lawn bill (~$2000/mo spread over year) so that wasn't really the issue. I saw that Group M was involved and they've rehabbed so many places (like Campbell Hotel) so I'll trust their judgement if they're the ones who said it's not feasible, but still feel like the citizens of Tulsa deserve to know why they're going to spend so much money to demolish these buildings which look very much salvageable and interesting on the outside and why our tax dollars paid to let them get to this point just to be destroyed. They had a RFP a while back and got a nice submission for street-fronting apartments with 100+ units. Looked pretty nice but very expensive. What happened to the 140 unit Rockford Park proposal? It had notable developers like Nelson Stowe and Ross Group behind it, along with Prairie Fire which specializes in affordable housing out of KC. Note in that layout on the right side it says "Connection to Future Park" where existing homes are. They plan to level several entire blocks to create a massive flood-control pond there. 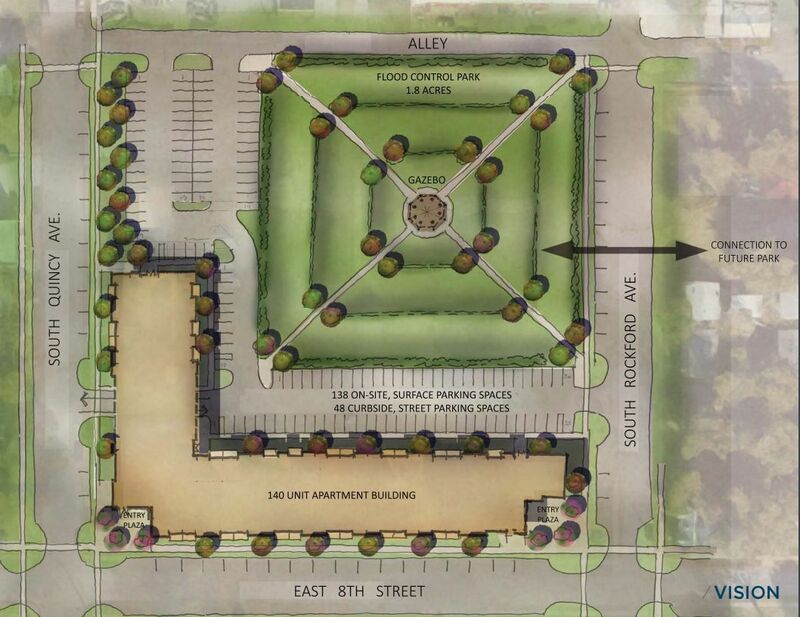 They also have yet another one planned for the blocks east of 75, north of 6th street and West of Peoria. So they want to just keep demolishing everything... It's like "Urban Renewal" in the 60s all over again. The main Pearl Pond is seemingly necessary for flood mitigation (I haven't seen that report) but the one by the highway is a $20 million project that will slightly reduce chance of flooding for 29 low-value properties and 1 expensive property that could have its own mitigation for far cheaper. The plan is to fund it by selling million dollar water front lots to developers!